‘Suicide is the major cause of death in all young people under 35 years of age’. That alarming statistic is one that will probably come as a major shock to many people. 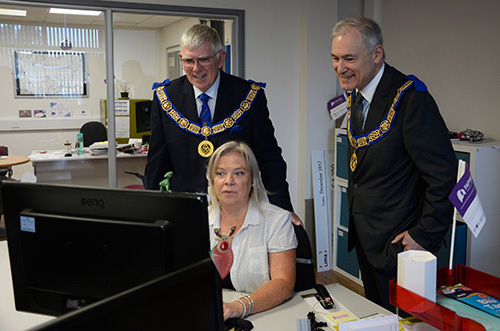 It certainly was to the Provincial Grand Master Tony Harrison who was visiting the Warrington headquarters of the charity Papyrus, who have received a grant from the Masonic Charitable Foundation of £65,342. Tony Harrison (left) and Stephen Blank are shown some of the details by Hazel Russell, Head of Fundraising for Papyrus. The MCF has made the grant on behalf of the Province of West Lancashire but on this occasion, Tony was accompanied by his colleague from the neighbouring Province of Cheshire, Stephen Blank. Papyrus, which was formed in 1997 in Lancashire, has three simple aims: Provide confidential help and advice to young people and anyone worried about a young person. Help others to prevent young suicide by working with and training professionals. Campaign and influence national policy. They summarise this as: Support, Equip and Influence. Stephen Habgood, who is the Chairman of Papyrus, then very movingly related his own story of the loss of his only child, Christopher 26, to suicide in 2009. Sarah Fitchett, a trustee of the charity, also shared her own tragic experience in speaking of the death of her 14-year-old son, Ben by suicide in 2013. Their openness in speaking so frankly about their emotional experiences was a very moving revelation to the visitors but also cause for admiration, as they explained how they are working to try and prevent others having to experience the same trauma. 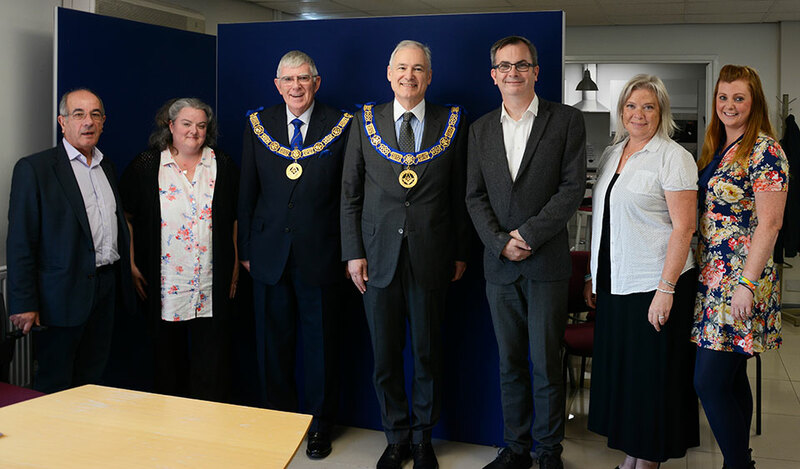 Pictured from left to right, are: Stephen Habgood (Chair), Sarah Fitchett (Trustee), Tony Harrison, Stephen Blank, Ged Flynn (CEO), Hazel Russell (Head of Fundraising), Lisa Roxyby (Head of Communications).